The Worldcup, according to Twitter! 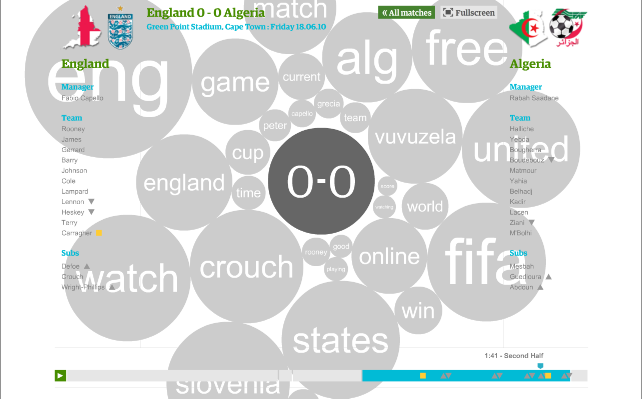 The Guardian has given us a beautful visualization-animation of the Twitter hum during the world cup games: Twitter Replay. While quite charming to watch, it also shows that live coverage might be a field of communication where Twitter gives us very little additional value: It’s basically the referees’s game report, pretyped by the multitude. No new insights seem to be trending here. This seems intuitive. The game is faster than its trends. Or, to be more precise… a goal is not trending. It’s happening. But of course, the poverty of visible twittered insight is further amplified by the concept behind the Guardian’s visualization. As an aggregation tool, it necessarily bulldozes over the details. And that’s of course where Twitter shines. 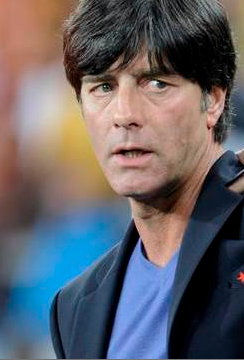 So if there was – let’s say – a really interesting discussion regarding Jogi Löw’s new Strenesse sweater, the Guardian’s animation would surely miss it. Nevertheless. Thank you Guardian, for this beautiful tool to pry open the cranium of the social web.